Residents on Lakeville Road in Jamaica Plain worked to clear out their vehicles on Sunday. Winter’s first big snowstorm ended Sunday evening, but the bitter cold that descended in its wake will linger into Martin Luther King Jr. Day and the beginning of the workweek, according to forecasters. Temperatures in Boston plummeted about 5 degrees in less than an hour Sunday afternoon, as the storm moved out of the region and and Arctic air poured in behind it, causing “dangerously cold windchills,” according to the National Weather Service. 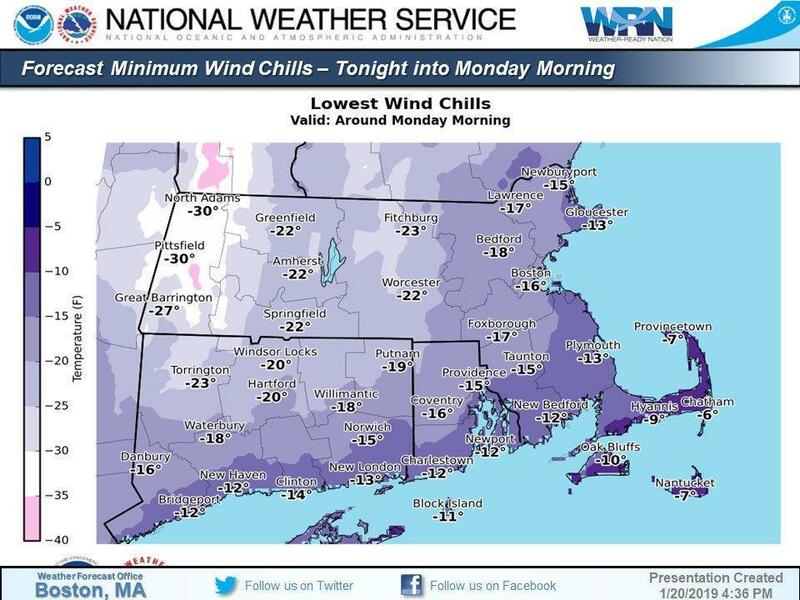 Monday morning windchills were expected to range from about 7 degrees below zero in Provincetown to minus 30 degrees at the opposite end of the state in North Adams, with Boston’s windchill near minus 16 degrees. The cold combined with the snow and ice that accumulated during the storm could cause lingering power outages and treacherous road conditions for those traveling on the holiday, the weather service said. Temperatures are expected to rise Tuesday and Wednesday before another storm system brings heavy rains from Wednesday night through Thursday night, according to the weather service. On Sunday evening, National Grid reported only a handful of customers without power in Massachusetts, and Eversource reported 885. Such frigid temperatures can be deadly for people without a warm place to stay. Outreach teams from the Pine Street Inn worked Sunday to encourage homeless people to come indoors, said Barbara Trevisan, a spokeswoman for the shelter. “They have identified the most vulnerable people and are making every effort to bring them inside. . . . The main thing is to keep everyone alive,” she said. Pine Street has a total of 670 beds, Trevisan said, and can house an additional 50 people using mats or cots. The organization was working Sunday with other shelters to bring people in from the cold. “We are not going to turn anyone away,” Trevisan said. She added that anyone who sees a homeless person in need of assistance in Boston should dial 911 to report the situation. Given the dangerous conditions, officials implored residents to stay home Sunday or to exercise great caution if they had to travel. More than 540 flights into or out of Logan International Airport were canceled Sunday, and 100 were delayed, according to the airline tracking website FlightAware. But airport operations mostly continued as usual, according to Samantha Decker, a spokeswoman for the Massachusetts Port Authority, which operates the airport. Getting around by land was at least as difficult as air travel, as ice and sleet accumulated on roadways and water pooled in low-lying areas. Sunday saw rollover accidents in Lawrence and Andover and minor crashes and vehicle spin-outs elsewhere, but no injuries were reported, according to David Procopio, a spokesman for the Massachusetts State Police. On the Massachusetts Turnpike, the speed limit was lowered to 40 miles per hour from Weston to the New York state line, and State Police placed additional restrictions on tandem trailers and hazmat carriers on roads, he said. In Leominster, a city plow truck tipped over while driving uphill on High Street Sunday morning, said Deputy Fire Chief Daniel Kirouac. The truck lost traction and slid downhill about 50 feet before striking a tree, then rolled onto its passenger side, Kirouac said. “The driver self-extricated; he’s fine,” he added. The MBTA reported some weather-related delays Sunday, mostly on the Green Line. On Monday, trains and buses will operate on a Saturday schedule because of the holiday. The T asked customers to plan for an extra 10 to 15 minutes of travel time and to visit www.mbta.com/winter-weather for updates. Keolis Commuter Services, which operates the T’s commuter rail service, reported delays Sunday for multiple trains, including a nearly hour-long delay on the Greenbush line. Keolis said the service will run on a normal weekday schedule Monday. The Bluebikes bicycle share system, which operates in Boston, Brookline, Cambridge, and Somerville, was temporarily shut down because of the inclement weather but was scheduled to reopen Monday. Many New Englanders seemed unfazed by the cold and damp. In Charlestown, married couple Emmett Mullin and Karen Singer, both 69, tightly held hands as they tried to navigate slick sidewalks beneath an umbrella Sunday morning. The Edgartown couple refused to let the messy weather spoil their weekend plans, which included staying in Sunday night at their daughter’s apartment to eat pizza and watch the Patriots game. 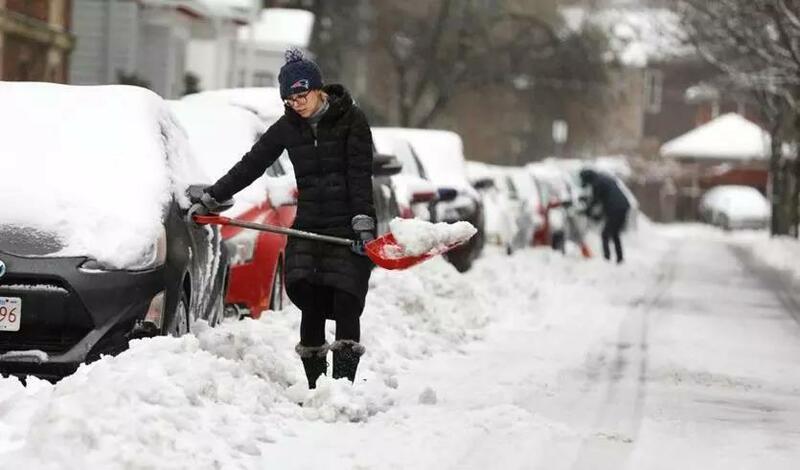 In Worcester, which had 6.5 inches of snow, public works crews had mostly cleared city streets by midday, according to Corey Hawkins, an employee at the Acoustic Java coffee shop. “They have been doing a great job,” Hawkins said. Acoustic Java saw a steady stream of customers, Hawkins said, adding that Worcester residents seemed to take the storm in stride. Joe O’Grady, a customer at the Miss Worcester Diner, said the storm didn’t keep people from their normal routine. Globe correspondents Sophia Eppolito and Lucas Phillips contributed to this report. Jeremy C. Fox can be reached at jeremy.fox@globe.com. John Hilliard can be reached at john.hilliard@globe.com.